2017 sees the return of the Cigar Aficionado 92-Rated Torpedo shaped Fine & Rare BR12-13. The ten tobacco blend is entrusted to a singular pair of true artisans to roll. The band proudly bears the name of the roller, buncher and supervisor. As well, Alan Rubin and Ralph Montero’s signatures appear on the bands, signifying the approval of each cigar. Only 2000 boxes have been created for global distribution. Available at appointed merchants, like we here at El Cigar Shop! The 2017 edition of Alec Bradley’s Fine and Rare, tagged the BR12-13, is a finely honed torpedo that features an exquisitely strong and spicy smoke with notes of coffee, sweet hickory, and a touch of beckoning leather. A Honduran cigar by nature, the filler is an amalgam of Honduran and Nicaraguan tobaccos that were created by a single pair of Tabaqueros. The first to bunch the tobaccos and the second to secure the wrapper. The honor of creating this limited release of 2,000 sticks is something that is considered an incredibly prestigious honor. 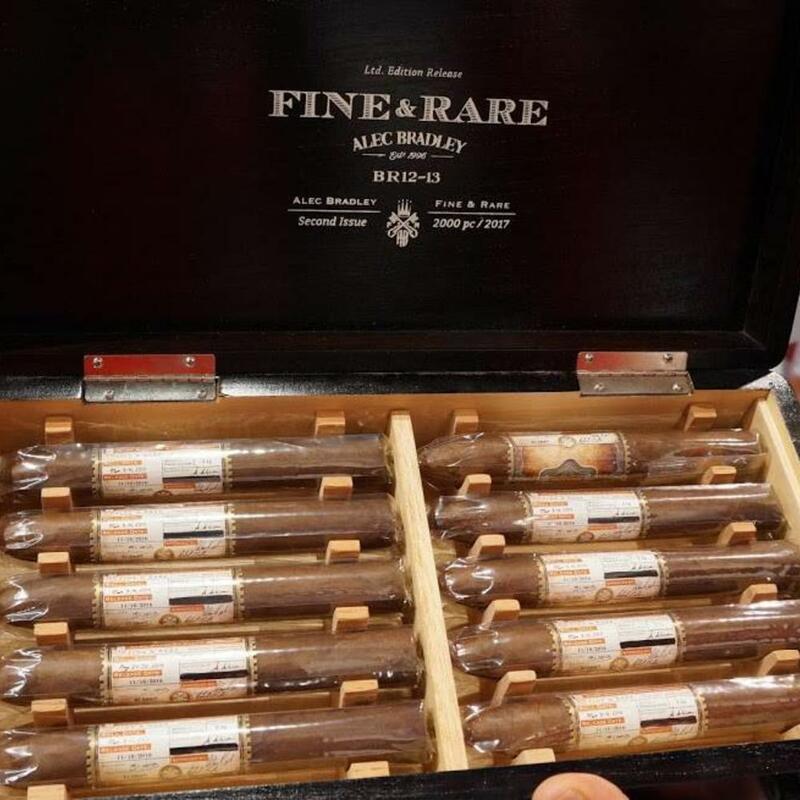 Receiving a rating of 92 points by Cigar Aficionado, the BR12-13 cigar lives up to the moniker bestowed by Alec Bradley of the Fine and Rare: “(the Fine and Rare) truly is a diamond in the rough, a rare find, a once in a lifetime opportunity. A gem being forged....over years of geological change… to make a one of a kind rock … We'll take the same concept and apply it to the Alec Bradley Fine and Rare. The finest ingredients, the best assembly, a quality smoke." The biggest secret behind the Alec Bradley Fine and Rare is something they haven’t disclosed to the general public, the cigar's filler tobaccos. They utilize 10 different tobaccos to make up one of the most incredible smokes ever created, and with just 2,000 sticks available worldwide, it would be wise to horde as many as possible of these truly, unique creations.